Flam Chen presents OCTOPUS HEART. Directed by Monica Silva, featuring the live music of Golden Boots and stunning visuals of Tra Bouscaren. Flam Chen Aerial Director Monica Silva shares a deeply personal & inspiring multi-media, physical theater, dance performance inspired by her occupation as an ER nurse. Our story follows a patient who enters the Emergency Room with chest pain and is ultimately diagnosed with takotsubo cardiomyopathy, or “broken heart syndrome” in which the heart muscle is damaged after a serious emotional shock. The syndrome was first diagnosed in Japan and named after the octopus pot (takotsubo), whose shape the heart mimics during this malady. Takotsubo can cause exactly the same symptoms as those of a heart attack, but the treatment is very different. We can “fix” a heart attack with powerful and effective medical treatments, but how do we deal with the unfixable, a broken heart? Often, medical staff rise to this very occasion, using not the tools learned in school, but rather their innate human capacity to care for another. Octopus Heart is not only a compelling kinesthetic performance, it is also an ode to the complex mix of beauty, tragedy, endurance, and survival demonstrated by both patients and staff in the hospital. This performance is ideal for audiences of all ages. 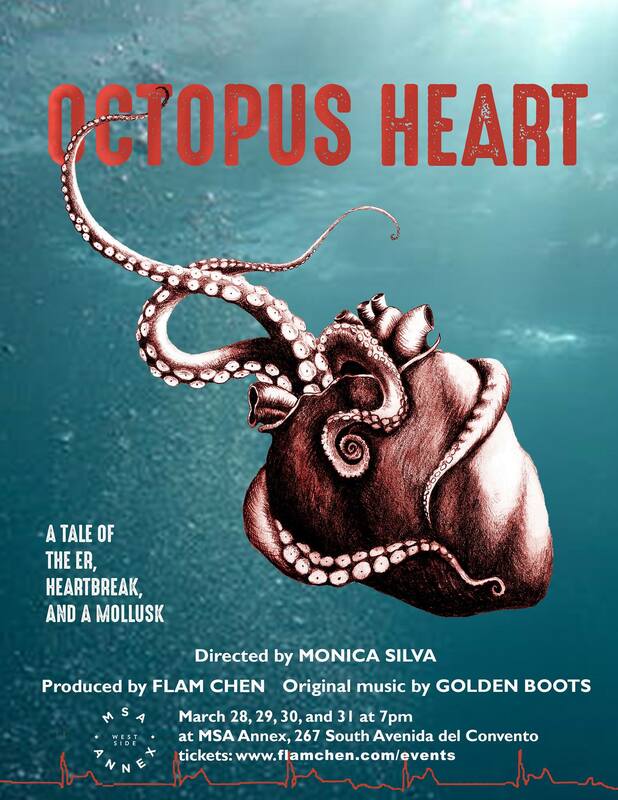 The dream of Octopus Heart was born one day in the ER, when director Monica Silva was pushing a patient through the hallway on a stretcher, and realized that at its heart, her job is full of art and ritual. An aerialist and a nurse, she envisioned a performance where her hospital colleagues, circus colleagues, her young daughter and a centenarian could all sit in the same audience and recognize themselves, while simultaneously discovering something new. • Producer Flam Chen– Flam Chen creates dazzling public spectacle, with over 20 years of innovation in new circus arts. • Golden Boots—beloved local Tucson band, composers of an original score for Octopus Heart. Ryen Eggleston, Dimitri Manos, Jeff Grubic. Additional artistic collaboration by Ryen Eggleston. Showtimes at 7:00pm on March 28th, 29th, 30th, and 31st!